State your preferred departure time on the booking form. (no trip on: 24-25 Dec, 31 Dec, 01 Jan). Enjoy the thrills and spills of Go Karting at a modern, high-tech indoor circuit. This is an adrenaline fuelled activity for experienced and novice racers alike. After picking you up from your Prague hotel, we drive for around half an hour to the outskirts of Prague to one of the longest Go Kart tracks in Europe. Get set for a few hours of pure exhilaration. The Go Karting track is inside a huge building with a roof made mostly of glass; this allows natural light to flood in. It is heated in the winter and air conditioned in the summer. The track is 670m-910m long (depending on the set up) and 6m wide, with 25 bends. The Go Karting is long, fast and technical. Safety is paramount. The track is equipped with a modern crash barrier system and drivers must wear safety helmets. Experience the rush of racing each other, as electronic timing devices on board the go karts record your movements and display times and positions on a large screen. The automatic Birel Karts are fitted with Subaru 200cc, four stroke, 5.5hp engines. Up to 14 Go Karts race at any one time. Groups can choose either exclusive or non-exclusive use of the track and facilities (see trip options below). Exclusive use (Trip C) is quicker because only your group is using the Go Karts and the track. Once the racing is finished, Trips B & C include two beers in the onsite bar. Includes: Return transport from your hotel + English speaking guide & instructor. Go Kart hire and racing sessions are not included in the price on this option - on the day, tell the guide how many sessions you require and they will organise everything. Go Kart hire prices per 10 minute session range from £5/€6/150 CZK per person (early afternoon) to £7/€8/220 CZK per person (evening) - payable at the track on the day. Includes: Return transport from your hotel + English speaking guide & instructor + Go Kart hire + Three 10 minute racing sessions (roughly 17 laps - which is a lot of racing) + 2 beers. Go Karts and racing sessions are included in the price on this option, so everything will be pre-booked which gets you racing as soon as possible. Includes: Return transport from your hotel + English speaking guide & instructor + Go Kart hire + EXCLUSIVE track use (as many racing sessions as you can fit in) + 2 beers. Once we have emailed you the quote, to secure the booking Trips A & B will require a 25% deposit; Trip C will require an 80% deposit (this ensures the track is reserved exclusively for you). From £29/ €32.50/ 995 CZK per person. 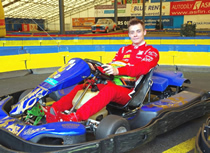 -Go Kart hire & racing sessions (Trips B & C).